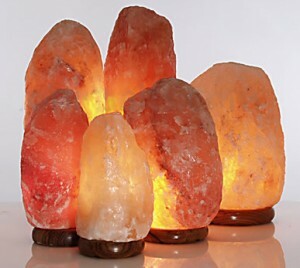 Our Himalayan salt lamps are hand carved and unique in shape and color, about 7 kgs / 15 lbs each. They are made from 100% grade A Himalayan pinkish salt, mined from what was once an ancient sea. They are equipped with 25 watt electric bulb with a special dimmer to adjust the lamp from very dim (night light) to the full 25 watts bright light. Salt lamps can be used in living rooms, bedrooms or other places to clear the air and give the fresh air feeling, due to the negatively charged ions they emit. Read here about different salt therapy avenues.